The plot twist is a fascinating element in storytelling. Respectable fiction uses it as a garnish, part of a wide variety of ingredients that add spice to a narrative. But a twist can be just as great when it's telegraphed or underlined. It can enthrall an audience and keep them on edge, just waiting for the other shoe to drop. 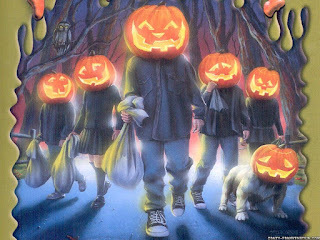 And boy oh boy, were people ever entranced by Goosebumps and its never-ending supply of ironic and unexpected finales. In this Halloween special, we examine the many facets of R. L. Stine's media empire, from the books and their awesome cover art to the Twilight Zone-lite children's TV series. And though we somehow forgot to address it in the episode, that bumpin' theme song is one of the all time greats. Listener, beware, you're in for a scare! "A Shocker on Shock Street"